"These women are seriously badass. Don't mess with them." "A Sister Act with Staying Power." "...These gals like their gritty Southern heritage with a cosmopolitan twist." 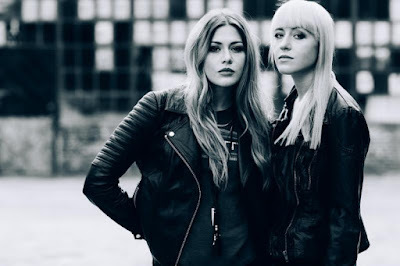 Sister roots rock 'n' soul band Larkin Poe has premiered their new single, "Trouble In Mind", on Paste Magazine. Fans can listen to the song exclusively, here: bit.ly/23JjoCf. "Trouble In Mind" is the first single off the duo's highly anticipated sophomore album "RESKINNED." In an effort to show off their true grit and evolution as a band, Larkin Poe immediately returned to the studio to record after concluding their world tour. This fresh version of the original album, KIN, includes new re-mastered tracks as well as productions by Chris Seefried (Fitz and the Tantrums, Lana Del Rey), Justin Warfield (She Wants Revenge, Nico Vega) and Wax LTD (Muse, Bon Iver, Miley Cyrus, Maroon 5). RESKINNED is set to drop on April 15 via RH Music. For more information, please visit larkinpoe.com. The sisters said, "We're Georgia peaches, born and raised in the South. We wrote "Trouble in Mind" as an homage to our roots: "A Georgia peach gone bad, yeah, you know the taste..." We may seem sweet and delicious, but take a bite and get ready for a kick in the teeth... We've come up steeped in the musical heritage of the South: the blues, country, southern rock - it's all in the bloodstream of our music and we're ready to let some of it out for y'all." Additionally, Larkin Poe recently announced that they will be joining Elvis Costello on the North American leg of his "Detour" Tour this spring. The first show is set to kick off on March 29 in Santa Rosa, CA and will wrap up on April 16 in Eugene, OR. Fans will have a chance to see the duo rock the stage as direct support as well as performing as Costello's backing band in 14 cities on the west coast. The band first connected with Costello when they were known as The Lovell Sisters. Since then, they have acted as his backing band numerous times over the course of the last five years. The ladies said, "We are so excited to be hitting the road with Elvis Costello this coming spring - in the USA and internationally! With our album, RESKINNED, slated for a spring release, we can't wait to get out and debut all our new songs for folks." Larkin Poe is a sister duo comprised of Rebecca Lovell and Megan Lovell - descendants of tortured artist and creative genius, Edgar Allen Poe. Rebecca (lead singer) plays guitar, mandolin as well as violin and Megan (harmony vocals) contributes on slide guitar, lapsteel as well as dobro. After experimenting with an array of musical styles, they found a way to blend together a sound that channels their distinct voice. The duo has previously hit the road as opening and backing bands for Conor Oberst, Kristian Bush (Sugarland) and Elvis Costello who praises that "they have a head start on the rest of us with the unique power and beauty of sibling harmony." With years of domestic and international touring under their belts, and a large and loyal fan base already in place, the sisters want their fans to know that their new album RESKINNED is truly their coming of age project.